Montenegro's parliament has ratified the country's accession to Nato, despite strong domestic opposition and Russian disapproval. The vote in favour - by 46 out of 81 MPs - paves the way for Montenegro to join Nato late next month. All but two of Nato's 28 members have ratified the accord. Russia long regarded Montenegro and neighbouring Serbia as allies. It has now banned Montenegrin wine and said it might move to defend Russian interests. The Russian foreign ministry said Montenegro's leadership and its Western backers had "ignored the voice of reason and conscience". "We reserve the right to take steps aimed at defending our interests and national security." Montenegro's Prime Minister, Dusko Markovic, dismissed Russia's wine import ban as politically motivated. Russia cited sanitary concerns. A fifth of all wine exports go to Russia, and the ban will have a significant impact on sales. "It is clear that the decision is in the context of Nato membership," Mr Markovic said. Montenegro and Nato: Foes to friends? Montenegro, home to about 633,000 people, was granted a membership action plan by Nato in 2009. A decade earlier, Montenegro and Serbia were bombed by Nato planes in a three-month campaign during the Kosovo war. Nato membership remains highly controversial in Montenegro, which broke away from Serbia after the collapse of Yugoslavia, becoming independent in 2006. Earlier this month Montenegro charged 14 people, including two Russians, with plotting to overthrow the government last October. 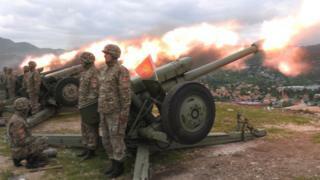 Montenegro: Nato's newest and last member?